When I went to college, I majored in Biblical Studies and minored in Speech. Obviously, I had a plan for what I would be in the future: someone who talk a lot. In Roy Buckelew and Steve Phillips at Ouachita, I was exposed to some of the best guidance in communication that I could imagine. 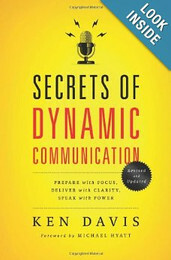 So, I was interested in to pick up the revised version of Ken Davis’ Secrets of Dynamic Communication. I have read the old version, but “updated” sounded good to me. I was greatly concerned that Secrets of Dynamic Communication would have been “updated” into an extended commercial for the SCORRE Conferences that Davis and Michael Hyatt do, and am pleased to report that it does not. While the conferences are based on the methods in Secrets, one should consider the book as primary. If you will read it, practice, and implement what you read, then attending a conference would be fun and helpful, but not critical. The conference would be awesome, but most of us can afford to buy a book. I think the conferences are beyond affordable for me. Davis has made a living communicating, and he started before you could tweet/FB/Youtube your way to fame and a platform. He had to be good at it, and good at it in various venues. The overall method demonstrated in Secrets of Dynamic Communication is about focusing your efforts on the subject and then presenting it well. This is a helpful method. Too often, speakers aim at nothing, and still hit it full on. The key secret to communication is focus, and that is the foundation of the SCORRE method detailed in Davis’ book. Davis writes clearly and practically. Secrets of Dynamic Communication is not a book for the communications theorist. There is no detailing of interference incidence or measurement of transmission. Instead, Davis focuses on how you can know you were heard and how you can eliminate what keeps people from listening. This is an immensely practical book, with just a few drawbacks. The biggest is that I would like to see a couple of basic online resources connected to the book. SCORRE uses a simple template for development of a speech, and I think it would be nice to place a downloadable template online. There’s a blank one in the back of the book, but you’re not likely to cut it out and duplicate it. Additionally, I would love to see an online resource section with video links to illustrate the material. While I know that would potentially change and become obsolete, it would still be helpful starting point. In all, though, this is a handy first-step into developing public presentation skills. On the homeschool front, high school oral communications classes could use this as their text on delivery of speeches. I received a copy of this book from Booksneeze in exchange for the review.